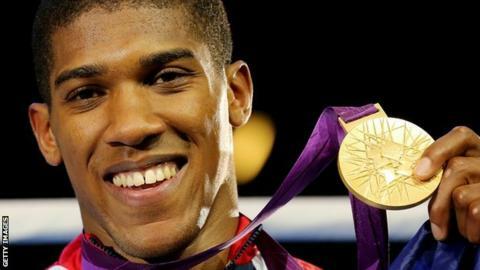 Professional boxers could compete at the Rio Olympics under new plans from the sport's governing body. AIBA president Dr Ching-Kuo Wu wants to abolish rules stopping any fighter with 15 or more paid bouts from competing. He added that it was "absolutely possible" to change the rules in time for August's Olympics. The British Amateur Boxing Association said it wanted to find out more about the AIBA idea. A BABA spokesman said: "The proposals have the potential to broaden the talent pool from which we are able to select boxers and we are look forward to hearing more about them in due course. "In the meantime, we have a squad of talented boxers that are all training hard to qualify for Rio 2016 and all of our efforts are focused on helping them to achieve this." The qualifying process for this year's Games is already underway, with 60 boxers having already secured their places in Rio. Wu, who has been president for a decade, added: "When I took over the presidency in 2006, I made it very clear the term of 'amateur' is not really relevant because when you look now at all the Olympic sports, who is really amateur? "It is an International Olympic Commission policy to have the best athletes in the Games. Of the international federations, AIBA is probably the only one without professional athletes in the Olympics." BBC boxing correspondent Mike Costello said the president usually gets what he wants, but there is still plenty to consider, namely how professionals will be assimilated into the process at this late stage. "In my view, it shouldn't be allowed to happen during an Olympic cycle," said Costello. "It simply isn't fair. "For 100 years or more, the Olympic medal has been the pinnacle of amateur boxing and that status is now being threatened." "The best amateurs might be able to deal with the best pros over three rounds, but what if a top pro is drawn against a weaker amateur from the weaker regions early in the draw? That certainly wouldn't be an edifying spectacle on what is the world's biggest sporting stage. "To question this proposal is not to be obstructive to change, but to protect the sporting traditions of Olympic boxing. This is a change that is monumental and shouldn't be rushed through."